Watch for thermal waves that would signal hydrogen flames. Do not touch or walk through product. Allow hydrogen-fed fire to burn if safe to do so. Protect adjacent surfaces equipment. Do not spray water into the pressure vent. Incident command and control areas should be established by the initial responders. 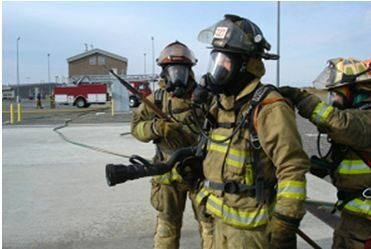 Web-based training program Introduction to Hydrogen Safety for First Responders is available from Hydrogen Tools portal.